We Are The Original Roto-Rooter! If it drips, leaks, or doesn't drain, it's time to call Roto-Rooter. Since 1940, Roto-Rooter has been providing efficient, effective service to their customers - residential, commercial, and industrial. Roto-Rooter's professional technicians get there fast and do a great job. Roto-Rooter has developed the best methods to free their customers of clogs and drain problems. Whether the problem is a backed up basement sewer or a clogged kitchen drain, nobody cleans them better than Roto-Rooter. 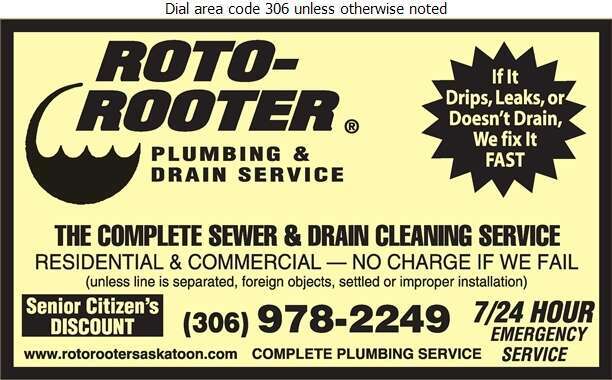 Often imitated, never duplicated - call Roto-Rooter, the one and only, today!